Bike thieves are after your ride. But you can make it harder to steal your bicycle. Follow these tips to make it more secure. We recently spoke with an undercover “bike vigilante” who helps the Minneapolis Police Department find and recover stolen bicycles. He’s honed a method of identifying and tracking bikes that go missing. As a result, he sees weak spots in many people’s bike security. He’s good at his job but wants to see less stolen bikes, period. He offered some simple tips to make bikes less appetizing to thieves, and vastly improve odds of getting one back if stolen. Maybe the most important thing you can do! If the police or Parker find your bike, the serial number is the first thing they look for to match it with an owner. Parker has found bikes he knows are stolen, but legally neither he nor the cops can do anything without proof. Look for an alpha-numeric code stamped on the underside (or somewhere along) the bottom bracket shell, this is most common. 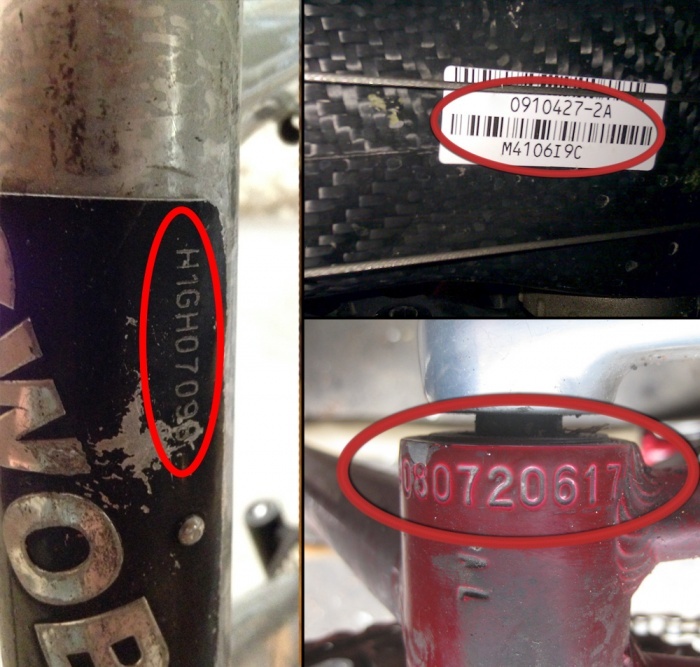 The serial number sometimes appears near the headset, or it can be listed on a sticker somewhere on the frame. Also, take pictures of yourself with the bike to help prove ownership. Don’t ever bother with a cable lock. It takes just moment longer to clip. 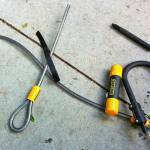 U-Locks aren’t impenetrable, but they take a lot more work and are very conspicuous to break through. While it might seem safer to lock your bike off the main drag, Parker recommends parking it where you — and others — can see it. Throw a sticker on your bike. Stuff a piece of paper with your name on it into the handlebars or seat tube. Or write your name on the underside of the saddle. Accessories can be removed, so mark the frame in some obvious ways. Add anything to make it uniquely identifiable. 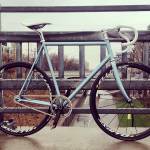 There are public and private registries where you can log your bicycle’s serial number. Some police and fire departments sell bike licenses and catalog your bike in case they recover it following a theft. Organizations like the National Bike Registry and Bike Index also help reunite stolen bikes with their rightful owners. Most people stealing bikes aren’t interested in riding it. They want to sell it. Parker recommends monitoring the sites OfferUp, VarageSale, Selio, 5miles, and Letgo NeerBuy. He also offers his services, as do entire bicycle communities, through stolen bicycle pages on Facebook. Twin Cities Stolen Bikes is just one of many around world where cyclists can notify the group, post pictures of the bike, and communicate in real-time if somebody spots the bike. 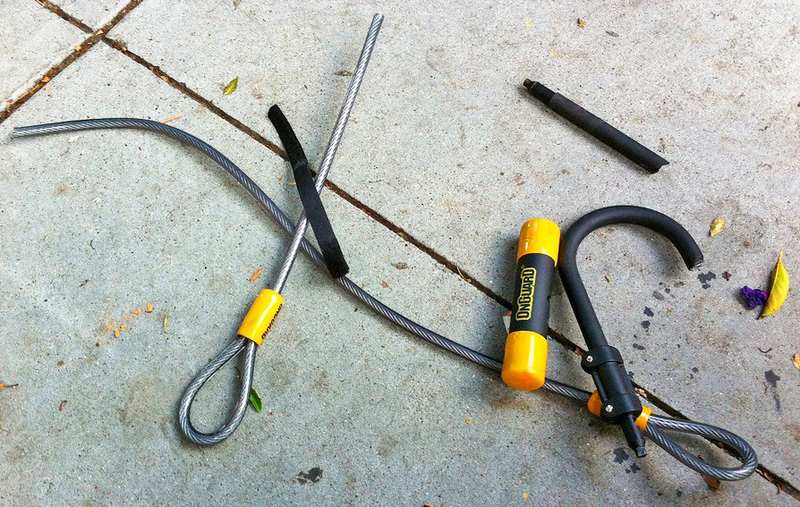 In short, invest in a top-notch bike lock, have proof of ownership (serial number or unique marking), and network with other bike people and local authorities. The more people know you and your bike, the harder it will be for thieves to go unnoticed.